Italy's economy tipped into recession at the end of last year, according to latest figures. In the final three months of 2018, the economy shrank by 0.2%, following a 0.1% decline in the third quarter, the Istat statistics office said. Meanwhile, figures from the EU showed economic growth in the 19-country eurozone still languishing. Growth in the euro area remained at 0.2% in the final quarter of 2018, the same as the previous quarter and in line with analysts' expectations. The renewed recession in Italy aggravates the problem the government has with its finances. The ruling parties' desire to increase spending to meet election campaign commitments led to a stand-off with the European Commission which argued Italy was going to be borrowing too much. Rome pared back its plans and the dispute was resolved. But the fact that the economy has turned out to be even weaker is bad news for the government finances. Tax revenue will be hit and that will tend to lead to a bigger financial hole to be filled by borrowing. Italy's problem is its accumulated debt, which is on one measure the largest in the eurozone. 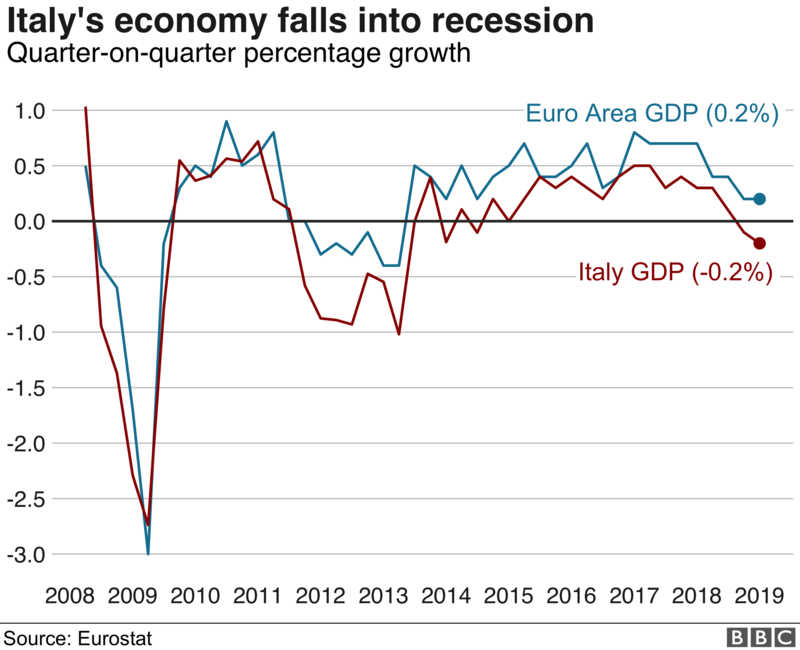 That is not a near-term prospect, but Italy's persistently weak economic performance makes it very hard to banish that risk conclusively. Italy has the biggest government debt in the EU at more than €2.3 trillion ($2.6tn; £2tn). It is also the fourth-largest government debt in the world. The country's debt burden as a percentage of annual economic activity is second only to Greece in the EU at 132%. Last week, European Central Bank (ECB) president Mario Draghi said eurozone economic data had been weaker than expected and the risks to growth had increased. Claus Vistesen, chief eurozone economist at Pantheon Macroeconomics, said that the overall eurozone figures "don't look pretty, but have been well telegraphed by the hard data and the financial market horror show in Q4". "Indeed, it seems to us that markets will be inclined to look at these headline [figures] as good news. They indicate that things probably won't get much worse in the near term - this is a bold assumption, given poor January survey data - and that the ECB will keep rates low for a long time." Haha oh no, game over! Although EU data is not critical but Eco. data weakening report by report. EURCAD has been in consolidation for the past few days and traders have been waiting for the pair to push higher. The pair began an uptrend in late 2012 with a series of corrections. Despite some drastic falls the pair has not been able to break the Monthly trendline.